Prepare this healthy recipe by warming the chicken broth and lemon juice in a small pan over medium low heat for 1-2 minutes. 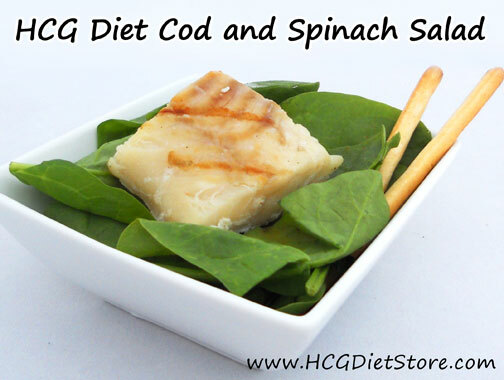 Sprinkle the raw cod meat with the salt and pepper, then place in the pan with the liquid. Cover with lid, and cook until the cod is opaque. Place baby spinach leaves in a small bowl or on a plate. Top with cod, and pour the lemon juice mixture over the top of the salad as the dressing. Serve this recipe with a grissini stick. This recipe is allowed on the VLCD phase of the diet (also known as Phase 2 or the 500 calorie phase). This recipe equals 1 serving of vegetables, 1 serving of meat. 1 serving of ‘carbs’, and part of your daily allowed juice squeezed from a lemon.